Muthukrishnan’s room number ‘005’ remains closed now. The melancholy in the red-bricked Jhelum hostel seems routine. With no note left behind, death of Jawaharlal Nehru University (JNU) scholar J Muthukrishnan continues to be shrouded in mystery. The 27-year-old dalit scholar was found hanging at a friend’s place in Munirka Vihar on March 13. Since then several theories have emerged around his death – some alleging caste-based discrimination; some questioning his confidence and some blaming his personal problems. His autopsy, conducted at AIIMS, though concurs with the suicide claim and rules out any “foul play”. While the police claim that the M Phil student was depressed over “personal issues”, it has registered a case of abetment to suicide under the sections of the Scheduled Castes (SCs) and the Scheduled Tribes (STs) Prevention of Atrocities (PoA) Act. “When equality is denied, everything is denied,” was Muthukrishnan’s last update on the social networking website Facebook. These words speak volumes about what could have been his state of mind in his last days. Muthukrishnan, who also went by the name Rajini Krish or Krish around the campus, had succeeded in getting into JNU after four attempts at the entrance exams. He completed his MA from Hyderabad Central University (HCU) and was known to be a close friend of Rohith Vemula – another dalit scholar whose suicide last year had sparked nationwide outrage over cast-based discrimination in the university. Muthukrishnan’s room with the number ‘005’ painted in white on the brown door remains closed now. The melancholy in the red-bricked Jhelum hostel seems routine, with its stillness disrupted only by the chirping birds from the thickets around and sporadic movements of the students coming and leaving quietly. “In the last four-five years, students’ urge to socilalise, brainstorm or simply come together has decreased significantly. Technology might be one of the reasons that they’re isolating themselves. But, people here are reluctant to talk about their own issues. Muthukrishnan didn’t spend much time in the hostel, anyway,” says Jitendra Kumar, his hostel mate and a long-time resident of the hostel. Krish, according to Kumar, had built up the image of JNU in his head to be too liberal, and got disappointed once he experienced the reality. “A university is no different from the society. Why would it be? Discrimination is out there, and it is in here too,” he adds. While the extreme step by Muthukrishnan is being linked to financial issues, family problems, and his lack of confidence resulting in depression, one of his close friends in the university Birendra Kumar refutes all these possibilities. “We used to routinely have intense discussions over a smoke. Vemula’s death was one of the topics we discussed several times. Krish always felt that suicide can never be a solution to the problem of caste injustice, although he understood Vemula’s frustration. But, he felt that we have to keep fighting. He would not approve of something like suicide. I really don’t know how it could change so suddenly,” he says. Kumar remembers him, like most of his other friends, as a person who always sported a smile, carried a book, and tried extremely hard to progress in life. Muthukrishnan’s father, Jeevanantham, is a labourer from Salem district of Tamil Nadu, while his mother is a daily wage labourer. This gives fuel to the speculations of his poor financial condition being the reason behind his ‘suicide’. But Kumar claims that he was financially in a better position recently, and was going through no major family crisis. “Nor it was the lack of confidence. Although he was not so fluent in English, he could manage to talk even to a Bengali – who may understand only English for hours. For me, this is what confidence is. And he had courageously survived so much to reach here; little things like family crisis could not bring him down. Whatever that broke him, ought to be huge,” he says. Several reports and fellow students from JNU suggest that Muthukrishnan had tried switching his supervisor for his thesis, and in the process, he ended up with no supervisor. According to a press release by Birsa Ambedkar Phule Students’ Association (BAPSA), an Ambedkarite students’ organisation in the university, when Muthukrishnan went back to the supervisor whom he wanted to switch from, the professor allegedly told him, “I am done with you.” BAPSA leaders claim that this could have been a trigger for his decision. However, professor Rajat Dutta from Centre for Historical Studies (CHS – Muthukrishnan’s centre), says that Muthukrishnan was supposed to be assigned a supervisor in April, as his request was in the pipeline. Rahul Sonpimple – the presidential candidate of BAPSA in the last JNUSU elections – holds the Left responsible for the stigmatisation of the Ambedkarite discourse in the university. “Some Duttas, Nairs, Mukherjees and Bhattacharyas are trying to claim that we are casteless and genderless. I want to ask them: which right-wing teachers in your department gave zero marks to the dalit students in the viva voce? Both Right and Left do not understand our discourse. They have problem with our autonomy, and that’s why we are isolated. If you cannot accept that this is an attack on our identity, you are still trapped in your savarna morality,” he says. Here Sonpimple highlights a longstanding allegation that the dalit students, who have performed well in the written exams, are purposely given scores as low as 3, 4 or even 0 in their interview round. Manohar* (name changed) – a dalit Ph D scholar, and a BAPSA member, had scored respectable 49 out of 70 in his entrance exam. However, during the interview round, he was giver a score of mere 3 out of 30. Anubhuti Agnes Bara – the former vice president of JNUSU and a CHS student – tells a similar story. She was at the second position in the written exam with a score of 54. In her interview, which had gone really well, and lasted for as long as 25-30 minutes according to her, she was given a score of 8 out of 30. “There is this intellectual hegemony at work in the institution. It’s considered fashionable to be a Leftist in JNU. Grades are given keeping students’ caste in mind,” she says. Sonmpimple claims that this is the reason Muthukrishnan could not get into the university in his initial attempts. An eight-member committee, headed by prof Abdul Nafey, studied this data between 2012 and 2015, and found that “the data consistently indicate the pattern of difference in the written and the viva voce marks across all social categories, which indicates discrimination.” To end this, the committee suggested reducing viva-voce marks from 30 to 15. Bal Gangadhar Baghi, a doctoral student and a BAPSA leader from JNU says, “The way they treat dalit students during the interview is atrocious. They ask you to say your full name to find out your caste. They ask questions to determine whether the student is leaning more towards Marx or Ambedkar. So many Dalits have been kept out of the university as a result of their radical Ambedkarite ideology.” Baghi alleged that he knows for a fact that the discrimination is rampant – especially in CHS. The issues has now become even more critical with the UGC gazette notification in 2016 mandating that the marks secured for written exam can only be considered to qualify for viva voce, and the marks secured in viva will be the final ground for admission. The Delhi high court recently dismissed a petition against the gazette and asked the university to adopt regulations “without any deviation”. Ramesh Nathan, general secretary of National Campaign for Dalit Human Rights (NCDHR), says that the dalit students are more aware of the caste politics than ever, and have much deeper understanding of caste dynamics. “Especially in the last ten years, the consciousness among the youths has significantly increased. Before that, even though dalits did progress and paved their way to some of the very respected posts and professions, many of them tried to hide their dalit identity. But now, even the first generation of learners from the dalit families are extremely vocal about caste-based discrimination. And upper-caste people are not used to this kind of momentum of the Ambedkarite movement,” he says. Nathan feels that the friction between the Left and the Ambedkarite movement is quite natural, since the Left has already enjoyed political power to an extent, and it has its own privileges – especially in a space like JNU. “Most of the leaders of the Left and their student outfits come from brahmin communities. So far, their approach is ‘class struggle’. Only recently, they have realised that they haven’t really addressed the root cause of the inequality – the caste system. This realisation has come very late,” he feels. Ideologically, dalit politics is vastly different from the Left politics, according to Nathan. “Unless Left demonstrates some credibility, it is difficult to imagine merging of the Left and the dalit movement. Let them exist separately. They can collaborate for certain common issues, but the dalit leaders have to lead their movement. Left can be in the background, showing solidarity,” he says. Professor Soumyabrata Choudhury, School of Arts and Aesthetics, JNU, who also knew Muthukrishnan personally, feels that the structure of the universities is responsible for inequality. 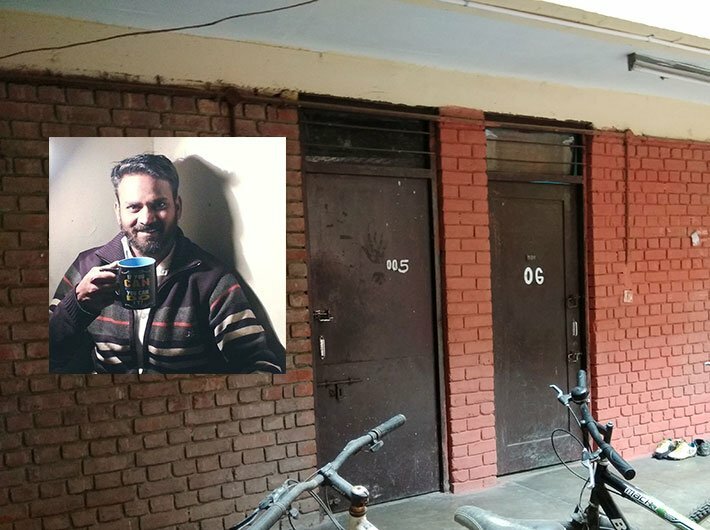 “Although no one has officially complained to me about any act of discrimination, I have been a student of JNU myself, and have seen a certain level of discrimination and alienation. Muthukrishnan had told me that he’s facing some issues in his department, but we never got to discuss it further,” he says. Choudhary feels that the hegemony of the Left is threatened by Ambedkarite movement. “Amedkarite perspective is a new persepective, and it’s a powerful perspective. It’s definitely a perspective, which has not been appreciated or even thought about by a large section of the Left. A factor is also that the Left parties have enjoyed some power, and power is a very dubious thing, although it can be also useful. It creates different kind of relationship between those who have power, and those who don’t. The powerful form an authoritarian structure, and are threatened by a force like Ambedkarite force, which is a real force,” he says.